The Girl Who Played With Fire, second installment from Stieg Larsson’s Millennium trilogy to open in UK Cinemas on 27th August. On 26th July Silva Screen is releasing Jacob Groth’s dark orchestral soundtrack and the album contains themes heard throughout all three films but mainly features the soundtrack to the second and third film. Also includes the theme used for the full-length TV versions and the end credit Goth-rock song “Would Anybody Die For Me?”, specially remixed for the album and performed by Danish singer Misen Larsen as featured in the second film. Nike plays with Chariots Of Fire. Of all the films released over the last 5-10 years the Harry Potter series has been a global phenomenon not dissimilar to the likes of James Bond. The new episode is poised to be the beginning of a very dark two parter culminating in the end of the series… Or not? Watch the trailer below & you can get your mits on the soundtracks from the series here. The Expendables Soundtrack coming soon! Directed by Sylvester Stallone Starring Bruce WIllis, Arnold Schwarzenegger, Jet Li, Jason Statham, Steve Austin, Terry Crews, Randy Couture and Dolph Lundgren this looks to be a pretty exciting action packed explosive movie. We will be releasing the original motion picture soundtrack to the film so watch this space for more info once the film hits cinemas in the UK. If you haven't seen the trailer yet - what rock have you been hiding under? Happy 25th anniversary Of Back To The Future! See the original trailer below. Get the theme tune here. The best water gun fight ever! Just good fun and a very new and good use of the Canon 7D digital SLR camera being used for shooting video to a very realistic equivalent to 35mm film! Wow how technology has moved on. Fantastic stuff. "I want 5 brothers" says the gorgeous blond to the bar man... hilarity insues as men do what only men do best. Track featured, Misirlou performed by London Music Worx. 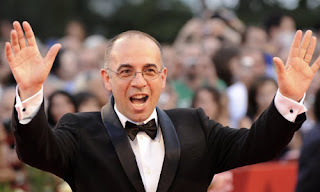 Winner of 2 BAFTA awards, another 27 wins & 19 nominations Giuseppe Tornatore teams up with Ennio Morricone to for the score to Baaria - 2009s Siscilly based saga. This autobiographical decade hopping score is as compelling as the careers of its makers. I've truly enjoyed every part of the album which features heavily on my Saturday night cooking for friends playlist planted on the kitchen iPod. Adidas Original - Star Wars Cantina video. This is very special, we absolutely love the work by Lucasfilm Ltd & The Mill, the baselight grading is expertly achieved and digital compositing using Flame is as seamless as you would expect from those guys. The music is brilliant and always brings a smile to the face of any Star Wars fan. Composed by John Williams you can pick up music from the Star Wars 6 films performed by the Prague Philharmonic orchestra here. Well kicking it off today we are now here on the web and will be blasting red hot topics to your retinas every day for those lovers of Film Music out there!